Looking for a power flushing service in Leicester? We are experts in power flushing. Our power flushing services start from £495 inc Vat. We use Thermal Imaging cameras to identify sludged up radiators. Power flushing is crucial for the maintenance of your central heating system. Over 80% of heating issues caused are by the buildup of sludge, debris and so much more. We provide a professional service to those who live and work in Leicester and the surrounding areas to help maintain their central heating system. 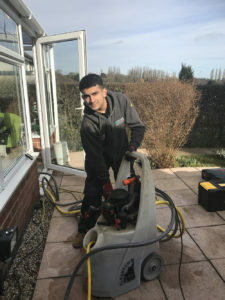 The procedure uses high speed jets at low pressures to flush out the pipework, freeing your central heating system from any obstacles that can create a blockage. Our plumbers in Leicester operate on a 24 hour emergency call-out service, and even if you haven’t got an emergency we can still provide a same day service. Our engineers are highly skilled and are considered masters of our trade. We have been expertly trained to deal with any power flushing requirement and we are all Gas Safe registered. How do you know whether your central heating system needs a power flush? Our experts are available at any time of the day to review your central heating system, and determine whether you need this service. We will provide complete transparency when it comes to our professional industry advice, and will disclose what type you need as we also provide a Magna Clean Power Flushing service. All our services are quoted at affordable prices. The quote given to you by one of our plumbers in Leicester will be the total price for the job, meaning there are no hidden costs. If you would like to know more about our services then please get in contact. Alternatively, you can check out our industry accreditation on TrustATrader.com and Which? Trusted Traders. We use Kamco CF90 power flushing machine with magnet attachment to do power flushing. We also use thermal imaging camera to identify sludge in radiators before and after power flushing.